Also: New funding announcements from Nomad Health and Powerdot. A bot by any other name. It appears that Pillo Health won’t be the only one selling its friendly home health assistant and countertop pill dispenser. 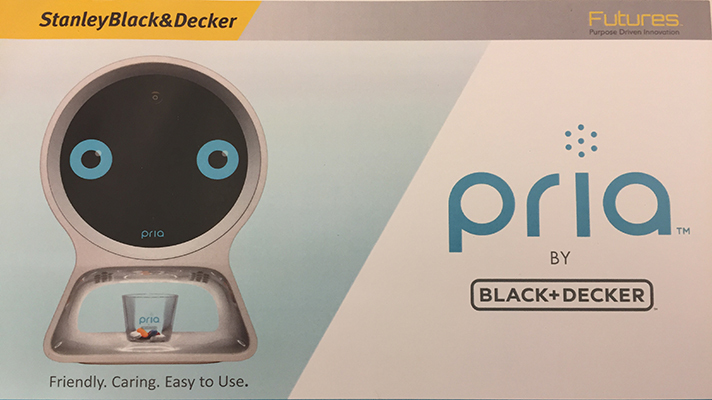 Thanks to a strategic investment by Stanley Ventures, Stanley Black & Decker will be offering a slightly modified version of the device under the name of “Pria by Black+Decker Home Care Companion.” According to a representative of Stanley Black & Decker and the promotional materials distributed at this year’s CES, Pria includes new features (such as human fall detection) as well as an independent back end and mobile application. Apple pushing for Medicare-subsidized smartwatches. Apple has been chatting up at least three private Medicare plans on the benefits a subsidized Apple Watch could bring their members, CNBC reports. While no deals have sprung quite yet, the newest device’s ECG, fall monitoring and activity tracking features could be a good fit for the over-65 demographic. The news comes roughly a week after Apple CEO Tim Cook told CNBC’s Jim Cramer that the company’s eventual “greatest contribution to mankind” will likely be its work in health. Nomad Health’s new backer. New York-based healthcare job portal maker Nomad Health has received a new investment from the California Health Care Foundation (CHCF), it announced today. The funding, an unspecified amount, is an effort by the foundation to help staff Californian regions in particular need of support — a growing issue as a large portion of the state’s overall healthcare workforce prepares for retirement. Docs, patients appreciate virtual visits’ convenience. Survey results published in the American Journal of Managed Care by a team of Massachusetts General Hospital researchers indicate that many providers and patients are generally open to replacing in-person visits with virtual appointments. Among 254 patients and 61 attending physicians who completed the survey, 62.6 percent of patients and 59 percent of clinicians reported no difference in the quality of their virtual video visit. Seventy-nine percent of patients and 70.5 percent of physicians found follow-up virtual video visits easier to schedule, and more than half of reporting clinicians found the virtual visits to be more efficient. "Our findings confirm what I felt in my gut, which is that what patients' value most is uninterrupted time with their doctor, and they put up with all the other challenges required to come see us,” Dr. Lee Schwamm, director of the MGH Center for Telehealth and the survey’s senior author, said in a statement. "Telehealth gives them more of what they want most and gets rid of the stuff they don't want. With a telehealth visit, 95 percent of the time spent by the patient is face-to-face with the doctor, compared to less than 20 percent of a traditional visit, in which most time is spent traveling and waiting. Seen through that lens, our results are not surprising." Dispatch Health expands to new regions. Tech-enabled house call service Dispatch Health has unveiled plans to expand into three new major markets, thanks to a handful of new partnerships with healthcare systems. Top among these partners are Baystate Health in Springfield, Massachusetts; Multi-Care in Tacome, Washington; and an unspecified nonprofit system in Texas. Powerdot’s tour de finance. Powerdot, maker of a mobile and wearable electronic muscle stimulation device, has received a “significant investment” from cyclist Lance Armstrong’s Next Ventures. Lionel Conacher, the venture capital firm’s CEO, will be joining Powerdot’s board with this investment.